Like Merchant Ships: What, you're not out yard saling? What, you're not out yard saling? I'm not sure that it's okay to make yard sale into a verb. But no, I'm not even tempted. Yesterday I went to the dentist for what was supposed to be a routine exam and filling and ended up rushing to Cool Springs for an after-hours root canal at the endodontist. Since I've never had anything other than basic dental care, it was quite a scare! Even with dental insurance, my checkbook is still trembling from the shock. Fortunately my worries about leaving the baby eclipsed my fear of the dental chair, and the procedure was over before I knew it.If my grandma (mom of 10) were still here, she would be sitting in her recliner, nodding and repeating one of her favorite truisms, "Have a baby, lose a tooth." 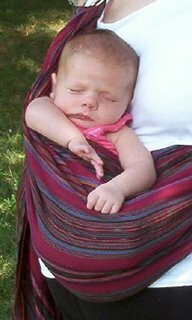 Other news: the baby is loving the Maya Wrap! My friend Jordana, whom I met through this blog, graciously lent me hers for a test drive. It's lighter and easier to tighten than the padded NoJo sling I had. So I'll be looking for one online or at the consignment sale next week. This has been a money-saving route because I am using a convertible car seat (skipping the infant carrier, which didn't fit right in my car, anyway) and forgoing the big stroller, too. I'll use the sling until our lightweight stroller becomes appropriate. 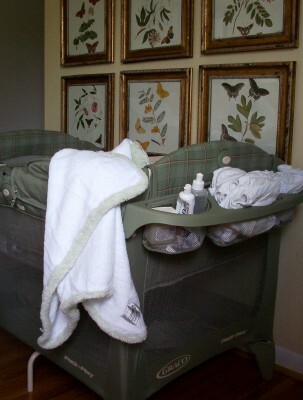 The readers who recommended the Graco Pack 'N Play with bassinet in lieu of a crib were right. It's wonderful! In fact, I think it's even more convenient than the crib, having the changing table and organizer on the side. We were able to preserve the guest room both for our upcoming company and for showing the house. I am so grateful for the good advice! Oh, the heirloom christening gown. One day left, and it's still missing. I got sad all over again when I showed my mom the photo of Andrew's baptism. It truly was exquisite--and totally wasted on a boy baby! The good news is that my mom found another one at the Goodwill. It must have been a God thing; in all our years of secondhand shopping, neither of us has ever run across one before. It was in the preteen department (!) for $3.49. What a blessing! I was prepared to run into Cradle Couture today and plunk down a huge amount for a replacement. My older son wore one my brothers wore and my 3 yr old wore a gown that was made for my dad (70) when he was baptized. It is just about to fall apart but is still in very good condition considering. I have kept my wedding gown fabric. When it comes time to dedicate our babies (We don't do christenings) I'm planning to have a gown made out of my wedding gown. If something happens and that doesn't occur I'll just dress them in fancy clothes off the rack. She also offers a limited # of slings for $20 or less. How nice. 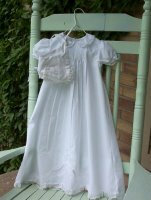 Now each child will have his/her own Christening gown to pass on to their children. Leave it to grandma! Isn't God good??? What a blessing to find another gown, at a great price and, as mentioned before, each of your children will now have their own to pass along to their own children. Talk about heirloom! I am listening intently to the sling and crib ideas. We haven't really even begun to think about all of that yet...so much to choose from. It's overwhelming. I made my slings too from the same website Elizabeth mentioned, but I use a different pattern from there. I've made two of the ring slings. The first one was double thickness - way too hot for Carolina summers. Then I made a thin muslin one that we ended using constantly. A pouch worked even better for me than the sling. There's a picture of one I made on my blog (in June I think). I liked it because there was no adjusting - just slide him in and out - and because it was very easy to change his postition. And super-easy to sew. I'll send you the link if you might want to try it. I'm glad you found a substitue gown. I have NEVER seen one secondhand either so I don't doubt it is a God-thing! I never thought of looking for such treasures at Goodwill!! I'm need to starting looking with more diligence instead of just glancing over the racks. A suggestion for your sling search: part of what makes Maya wraps so wonderful is that breathable, flexible yet sturdy Guatamalen (sic) fabric. After trying a friend's Maya wrap I made my own, and the first try in a very pretty polished cotton turned out to be too hot for both baby and me. My second try I used a seersucker type fabric and it was much more comfy. I bought my rings from www.elizabethlee.com and found plastic lighter and thus more comfy than metal. Hmmm, reminds me I need to see about supplies to make my sister a sling before her first baby arrives in November. Yikes! A newborn and a root canal! Are you able to take pain pills? When I had a root canal, the most painful part was to the checkbook; the meds took care of the rest. BTW, Meredith, you have given me a new, more positive, outlook on house repairs. I appreciate that, since house repairs will be in my future for a long time. I am so glad that you were able to find an alternative gown- it is so beautiful! What a find! I've been eyeing the Maya wrap for a while - it looks like it would be way more comfortable than the snugli that I'm currently using. Ugh about the dentist! I go on Thursday for some major work - but NOT a root canal - and am NOT looking forward to it. the baby looks precious in the wrap. my pocketbook is still shaking from my root canal what, now 3, 4 years ago. so bad that i still just have the cement (or whatever) in the tooth instead of the costly crown. i keep saying i need to get it then thinking of all the other places the money could go.